Vanilla can easily be described as one of t he coolest new eateries in town. 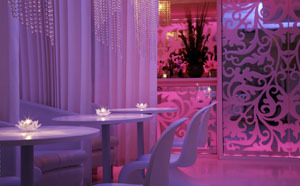 Descending steps from street level you have the impression of entering a club, a sensation that is enhanced as you step into the Vanilla Lounge, the bar and lounge area that makes up the ‘vanilla flower’ as it were. 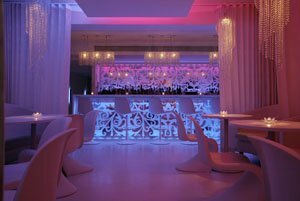 Following this theme the tones are soft creams, diffused with coloured lighting that creates a wonderful blend of vodka bar cool and retro futurism. Call me crazy but the latter always gets me a little excited. No dreary standard contemporary décor here then; that interior designer was not hired for the job. Instead, this is definitely a place where you could picture the cool set. In fact, you feel pretty cool just sitting here, reclining on sculpted seats and ordering one of the vanilla shakes that the Vanilla Lounge specialises in. If the lounge is the ‘flower’ then the restaurant is the ‘vanilla pod’. Soft, light shades turn to an ambient black punctuated by warm lighting to create an intimate dining environment. The same can be said of the scale, for while it seats enough people to create a lively atmosphere it is in no way cavernous. Romantic tables for two alternate with cosy booths, another personal favourite. Vanilla, you will find, is London’s first restaurant to offer a ‘tasting menu only’ dining experience, and somehow this concept is recognisable in the décor and the demeanour of the waiters and sommelier. The latter, while friendly, efficient and dedicated to your every whim, are also clearly passionate about the food being created here – created being the operative word, for the cuisine prepared by head chef Izu Ani ranks very high in the creativity and uniqueness ratings. For once it isn’t an overstatement. The cooking style of Izu is clean, fresh and light, but this pioneering chef is also marked by the extremely high levels of skill acquired in over ten years of experience with two-Michelin star restaurant The Square, in London, and in five Michelin starred restaurants in France. He offers three tasting menus, priced at £40, £50 and £75 per person for respectively four, six and ten courses. All three are a true experience and require a healthy appetite – appealing both to the gourmet and the gourmand within you. 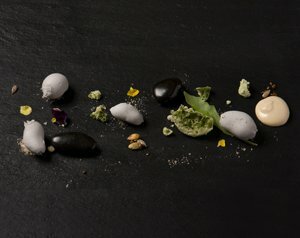 Even the smallest of the tasting menus features such delicacies as scallops on a potato-black pudding terrine with pork belly and Chinese pear, or the amazing 64° egg – steam boiled for 45 minutes with a dash of oak and jasmine smoke so that the egg white and yolk have the same consistency. An egg like you’ve never had one, set upon a delicate ensemble of Jerusalem artichoke, Spanish lomo and cassava sprinkled with spicy salt. It’s a fine example of this chef’s technical ability, as is the amazing pre-starter dish of potatoes cooked with a covering of edible Australian white clay, served on a hot black stone with garnishing of coriander essence and scented salt and herbs. This in itself is an experience that can be sincerely called unique, as your natural hesitation is overcome by the fascination and intense flavour of this signature dish. After it, sea bass served on a bed of chervil puree, hazelnut paste and lime caviar topped with scallop foam seems quite ordinary – but of course it’s not. Izu is an artist, a sculptor whose medium is food, so you can be assured that every single dish on the menu has been lovingly conceived and crafted, right down to the basmati ice cream, green apple sorbet and salted caramel with Brazilian tonka beans. Add a fine wine list and true foodies can strap themselves in for an enjoyable gastronomic quest. The intention behind it all is surprisingly simple: for guests not just to enjoy some drinks and a fine meal, but a true experience. Vanilla’s concept may not be to everyone’s taste, but if you love food and are even a tad adventurous you simply cannot deprive yourself of this culinary voyage of exploration. This entry was posted on Thursday, November 3rd, 2011 at 1:05 pm	and is filed under architecture, Environment, Food & drink, Freelance Writing, Travel. You can follow any responses to this entry through the RSS 2.0 feed. Both comments and pings are currently closed.